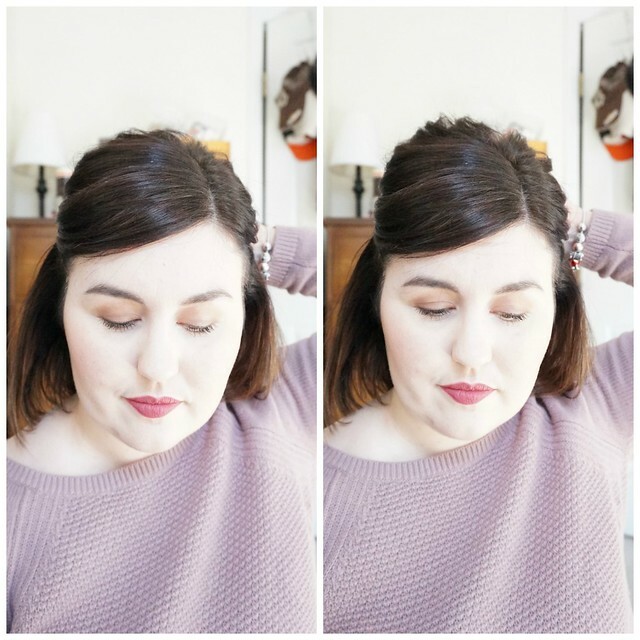 Today, I want to share a couple ways that I extend my hair styles. 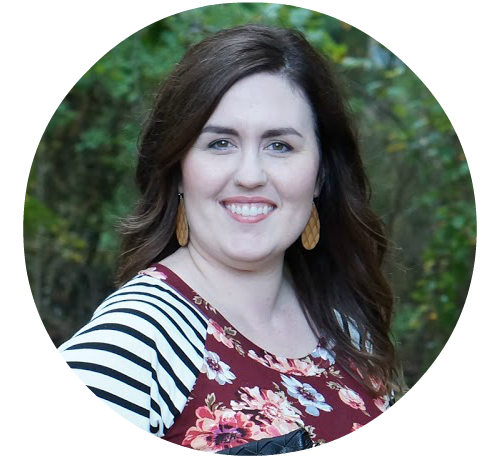 I have a couple of go-to styles that save me time each morning. My hair has always been a very dark brunette. I started going gray just a bit in my teens and by my late 20’s, I was coloring my hair every month. Eventually, I decided to get my hair colored professionally. It looks so much better when my hairdresser does it, but it can be pricey. 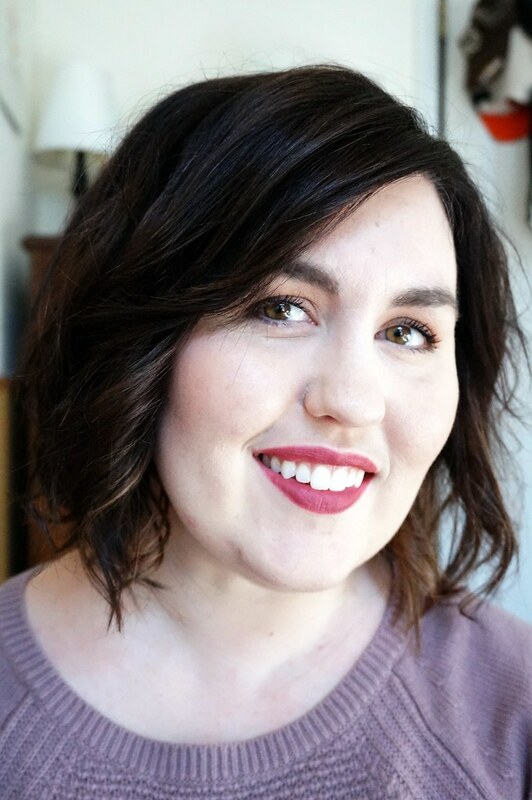 I’ve been using the John Frieda Root Blur to disguise my grays in between hair appointments. It has helped my color look fresher for longer! 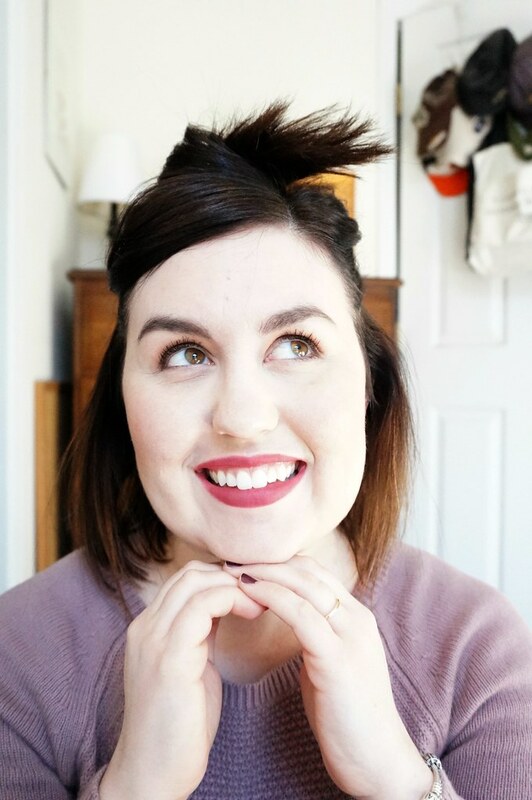 I also want to share two hair styles that I use on days that I don’t wash my hair. 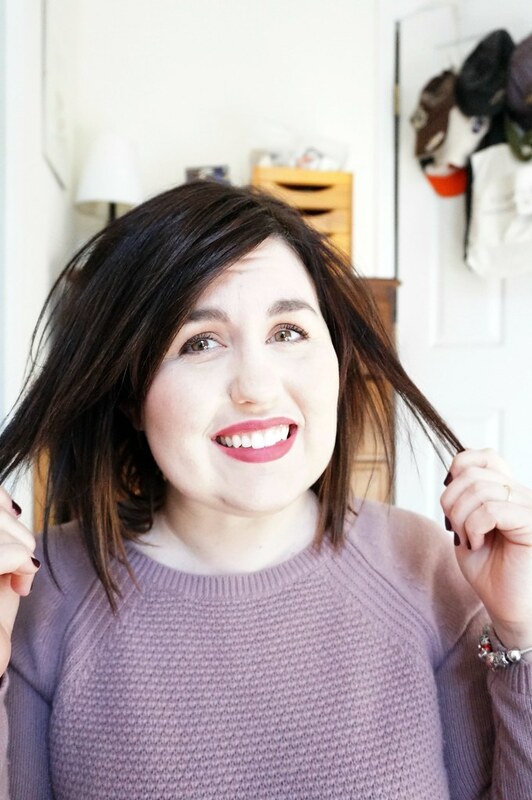 I used to wash my hair every day, but as we’ve had more kids and gotten more busy (and more tired, honestly), I’ve used dry shampoo to extend my hair washings. My hair actually looks better if I don’t wash it every day. These two hair styles give me some variety throughout the week. This first hair style is my usual ‘day two’ hair. 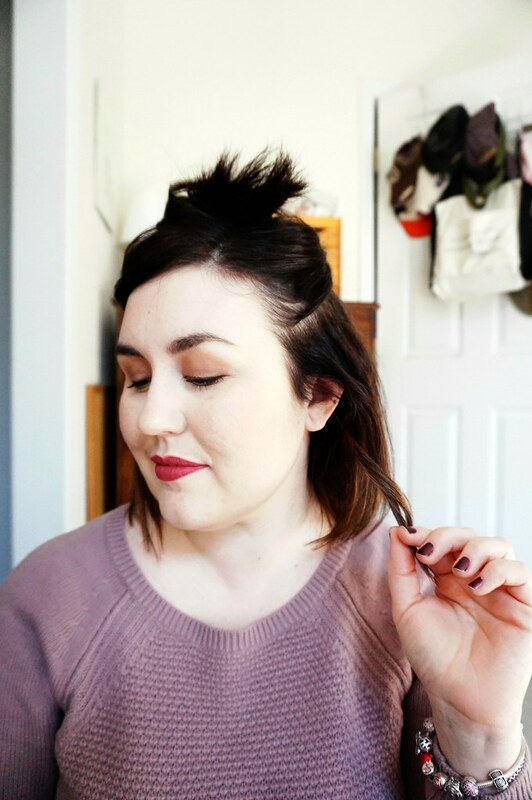 I like to pull my hair back off my face, but style can’t look quite boring if you don’t bump up your hair. Before, I do anything, I tease the hair at the crown of my head. I don’t tease it too much, since it’s not great for your hair. Just a little teasing will give your hair volume. Then, a couple inches above my ears, I pull back the front sections of my hair. 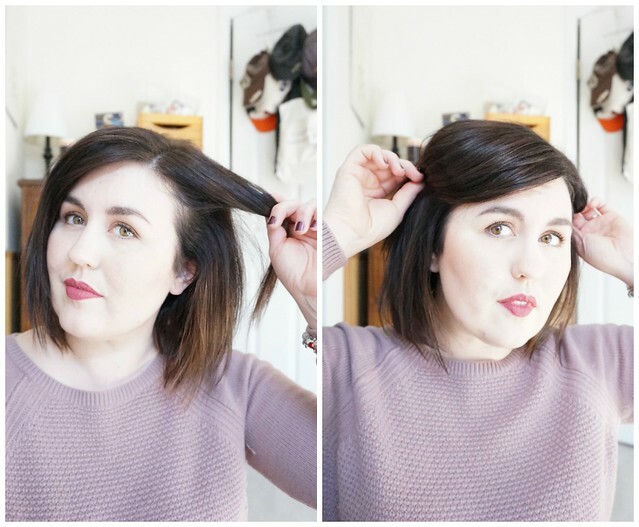 You don’t have to pull back a lot of hair. Just the front sections will do. I grab my claw clip. A tiny one is perfect for this style. If your hair is thicker, you’ll want to use a larger one. I prefer clear claw clips, because they don’t stand out against my dark hair. 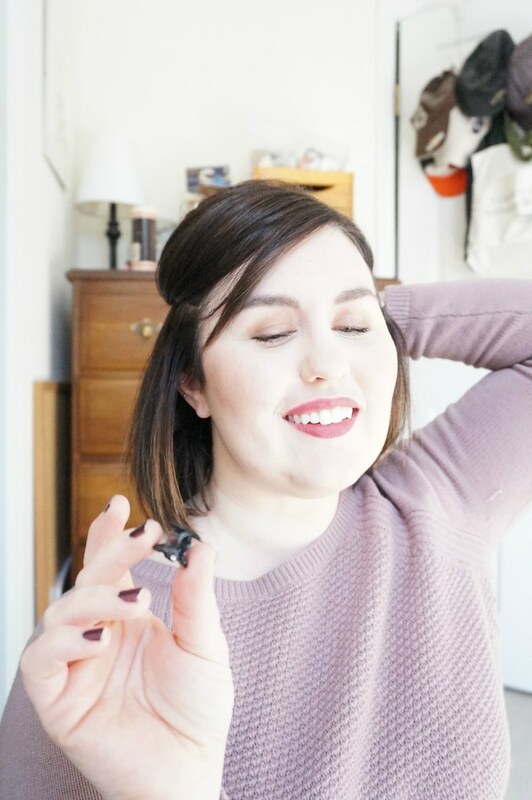 Before I secure the claw clip, I make sure and do one trick to give my hair some volume. If I were to pull back to my hair and just clip it like that, my hair would look flat. I like to combine the two sections of my hair and then push them up just a bit. 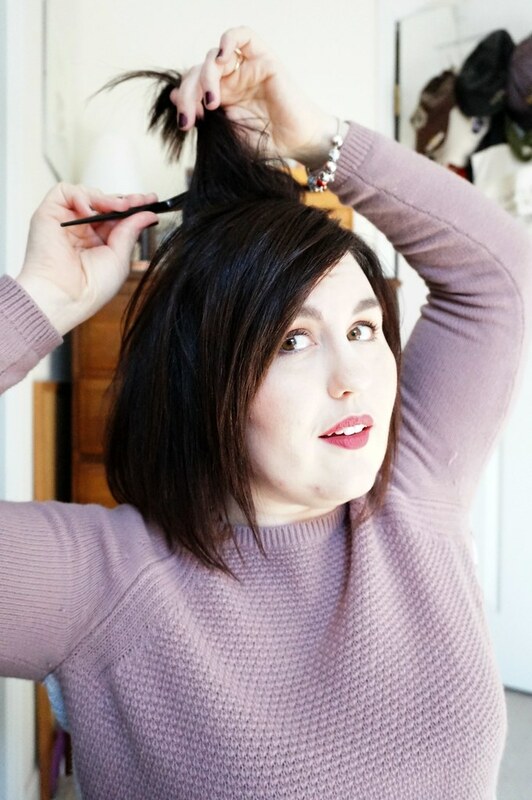 It bumps up my hair to create a flattering shape. The thing about this hair style is that the hair line along my temples is visible, and that is the first area of my hair to look gray when my color grows out. 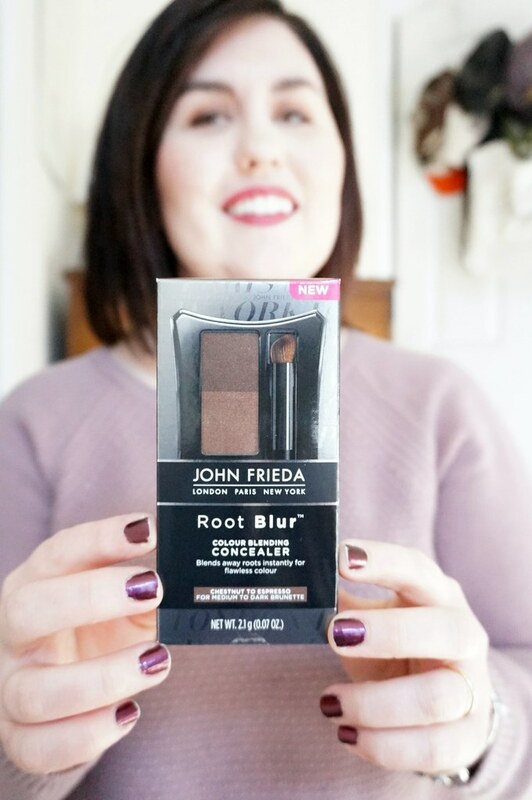 Right before I jet out the door, I grab my John Frieda Root Blur in Espresso. This color is for medium to dark brunettes. It has two colors, so you can completely customize the color you put on your hair. If you are mixing the two colors, you should start with the lightest and then build it to be darker. 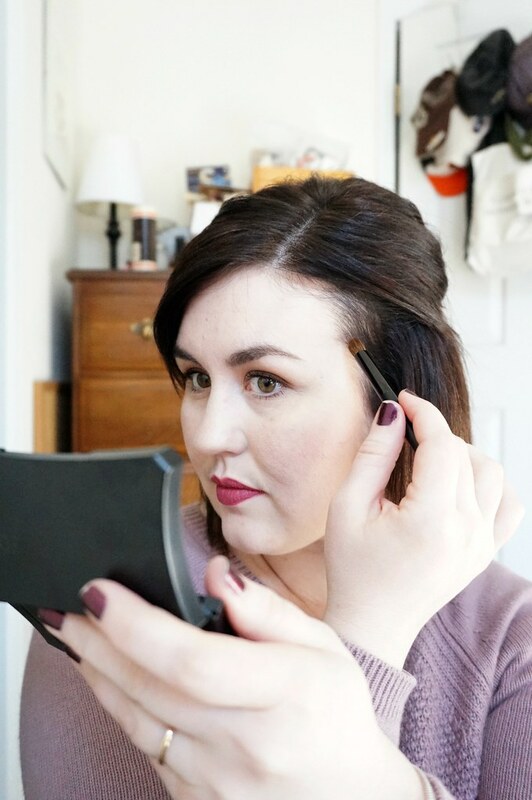 All you do is take the brush applicator, get some of the product on the brush and apply it to the roots of your hair. Don’t apply it to your scalp, only to your hair. This will last until the next time you wash your hair! 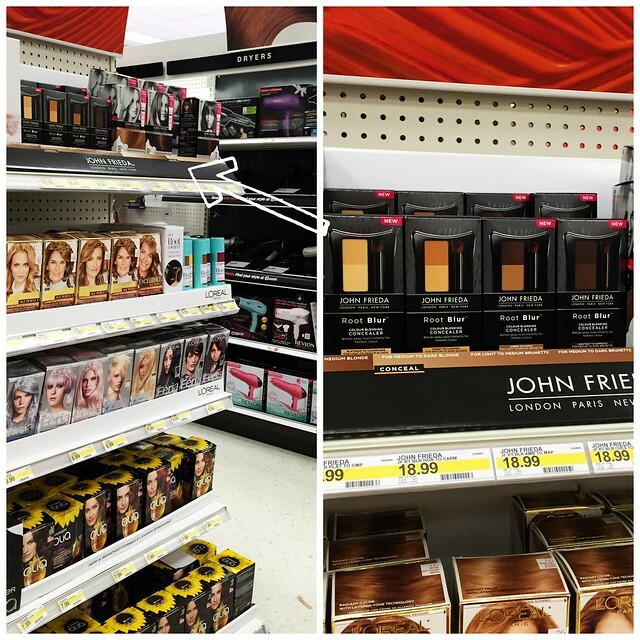 I get my John Frieda Root Blur in Target. It’s right at the top of the endcap near the hair dryers and hair tools. You’ll be able to find it on an endcap until March 5. There is also a promotion going on.If you buy three products, you will receive a $5 Target gift card. 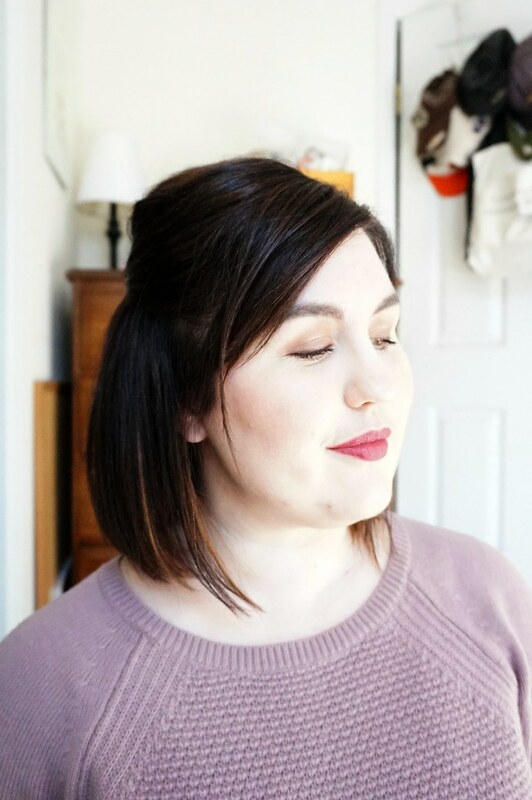 My second hair style is my favorite way to create beachy waves in my short hair. 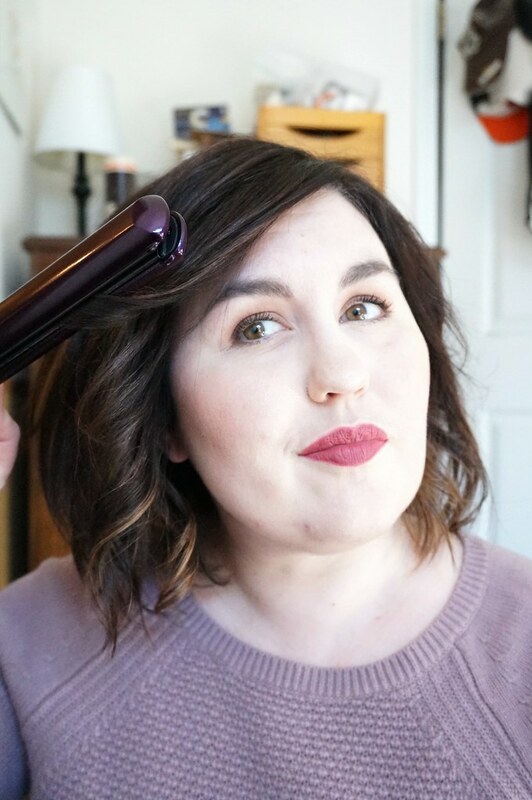 I played around a lot to figure out the perfect way to curl my hair with a flat iron. Incidentally, it makes my hair look wavy and I really love it. It’s super easy! First (obviously), I pin up the top two-thirds of my hair. It’s easy to work from the bottom up. Then, I take a small section of hair, usually about an inch in width. If your hair is thicker, you might want to take less hair in each section. Clamp your flat iron down where you want the wave to start. Then, rotate the flat iron 180 degrees. Slowly pull the flat iron down the length of your hair. And it creates the perfect wave! If it curls your hair more than you’d like, pull the section straight while it cools. 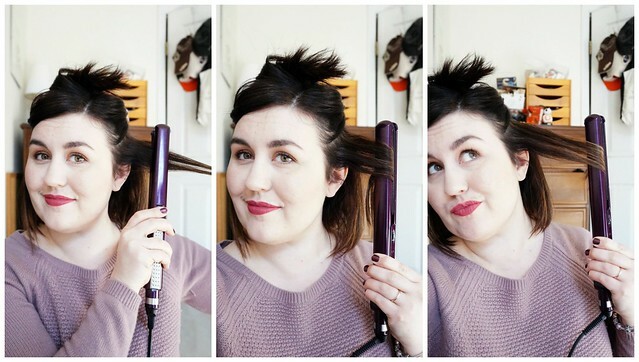 Just continue this all the way around your head, alternating the direction you rotate the flat iron. This will create more natural waves. When I get to the top layer, I like it to look a little swoopy. I clamp the flat iron on the section that I want to swoop, then I flip it in the direction that I want my hair to go. And that’s it for my beachy waves! Ta-da! 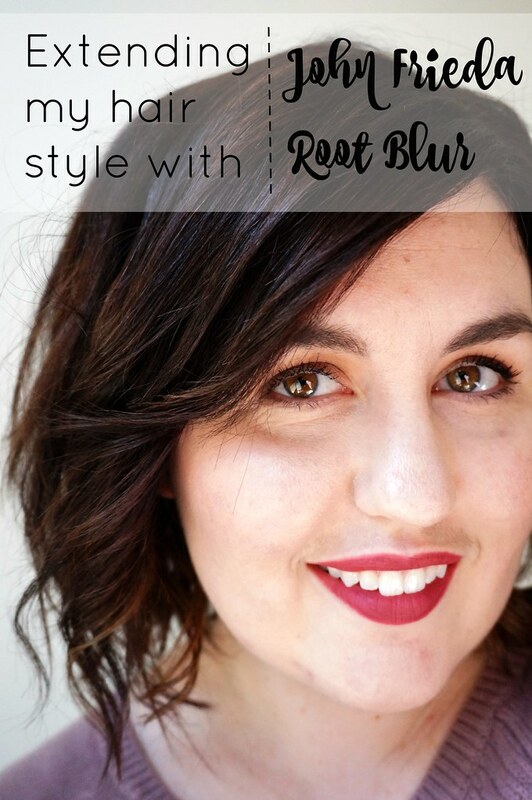 How do you make your color and style last between hair appointments? I’d love to hear what you do!